The deep square fired ceramic sinks beloved by decorators have a long history. Often called Farmhouse sinks in Europe and North America, they are also known as Belfast or Butler's sinks. They are all available in a range of styles, the most common being a gently rounded smooth rectangle, but variants with elaborate front moldings, fluted fronts and apron fronts or squared edges are also common. These dollhouse sinks in farmhouse styles are simply made from a rectangular wooden box, finished with epoxy putty, paper clay, air dry clay, or gesso to give it the look of ceramic when finished with a coat of white or cream acrylic paint and a final glossy acrylic clear coat or a coat of clear nail polish. The sinks shown in the photo on this page are not finished (you'll be able to see the finished sink on the cabinet base in a later tutorial). We've set this sink up in the standard commercial measurements (29 inches by 18 inches by 10 inches deep) scaled down to 1:12 scale. It is easy enough to scale up to 1:6 scale, or down to 1:24 and 1:48 scale. In smaller scales, you may want to ignore the wooden box, and make the basic box from lightweight card or paper. You can use a heavier cardstock (bookboard or illustration board)to make the larger scale sinks instead of wood if you wish. Just for comparison, We've shown a variant of the sink in the progress of being formed from polymer clay in a single serving jelly/jam package. If you dust the package with talcum powder you should be able to shape the clay in the mold and release it to bake or cure it. As you can see in the photo on this page, sinks made in these molds are much smaller than the sinks made to the measurements of full-size sinks. They may work for smaller scales made this way. Craft Wood or illustration board, bookboard, card or paper depending on scale. For a 1:12 scale sink we used 1/16 thick craft wood (lime (tilia) or basswood). Artist's Gesso or paper clay or air dry clay (Das or something similar). Acrylic Paint - white, cream or bisque are the most common colors for these sinks. Acrylic Clear Coat or Clear Acrylic Floor Polish or Clear Nailpolish for the final coating on the sink. Eyelet - for the sink drain. (sewing or scrapbook eyelets or leather rivets work well) we used a 3/16 inch (4.7mm) eyelet. Note: - a pdf (acrobat reader required) version of the sink base cutting diagram shown in the photo above can be downloaded and printed off for reference. Cut the pieces for the farmhouse kitchen sink base. The base can be made of wood or bookboard for a 1:12 or 1:6 scale sink. For smaller scales, you can use illustration board or stiff card. For 1:12 scale farmhouse or butler's sink you will need the following sized pieces. We first cut a strip of wood 13/16 inches (17mm) wide from my 1/16 inch (2mm) thick stock to set the width for all the pieces except the base. Ends Cut 2 pieces, 1 3/8 inches (3.4 cm)long by 13/16 inch (17 mm) wide from 1/16 inch (2mm) stock. To assemble the sink base for the dollhouse farmhouse sink, and all cut edges with fine sandpaper on a square sanding block. If you know where you want your sink drain to be you can drill a hole to fit the eyelet size you are using for a drain. Glue the two end pieces flush with the ends of the base so the base is against the ends. When the glue has dried on the ends and the base, glue the front and back so they cover the edges of the ends you first glued and the edges of the base. Clamp the box together and allow to dry. You can easily make a metal drain for the base of your farmhouse sink. We used a 3/16 inch 4.7mm eyelet and drilled a hole in the base of the sink to accept it. The eyelet will be placed into the drain hole once the final sink coatings have dried. Many farmhouses and Belfast sinks have the drain slightly off center. There may also be an overflow or 'weir' on the side of the sink closest to the drain. If you want to fit a 'weir' to your sink, it is easiest if you finish your sink with an air dry clay, and use a piece of scrap wood, covered with plastic, as the form for your overflow around which you wrap your clay. Take care when sanding the sink, the smoother the coating, the more realistic your final sink will appear. Another style of farmhouse sink has a fluted front, with or without an overhanging square 'apron' edge at the top. This sink can be shaped in soft air dry clay laid over the wood sink base, and allowed to dry, then sanded, or it can be built up in layers of gesso. Here you can see the fluted sink started in gesso. A round ended toothpick was drawn through the first coat of gesso to mark the rough flutes for the front of the sink. Once the first base layer of gesso (or air dry clay) is dried, you can sand the flutes on the first layer of gesso using sandpaper rolled over a rounded toothpick or file handle and begin to build the fluted face of the sink up with a second layer of gesso while you add an apron edge. To add the apron edge, a straight edge scrap of wood or plastic is laid up against the front upper edge of the sink, and extra gesso is placed over the upper edge down to the form. Once the gesso is partially dry, the form is removed gently. When the gesso is fully dry the edge can be sanded with sandpaper over a sanding block, and any holes filled with more gesso. Continue building up the flutes and sanding them, and building up and sanding the apron edge. If you want both flutes and an apron edge, it is probably easier to get the flutes fully built up first and sanded to their final shape, then add the apron edge. In our sample, we tried to build both the flutes and the upper edge at the same time, which is a problem when you sand the flutes. The final variant in the set of farmhouse sinks is a sink with a raised pattern on the front. 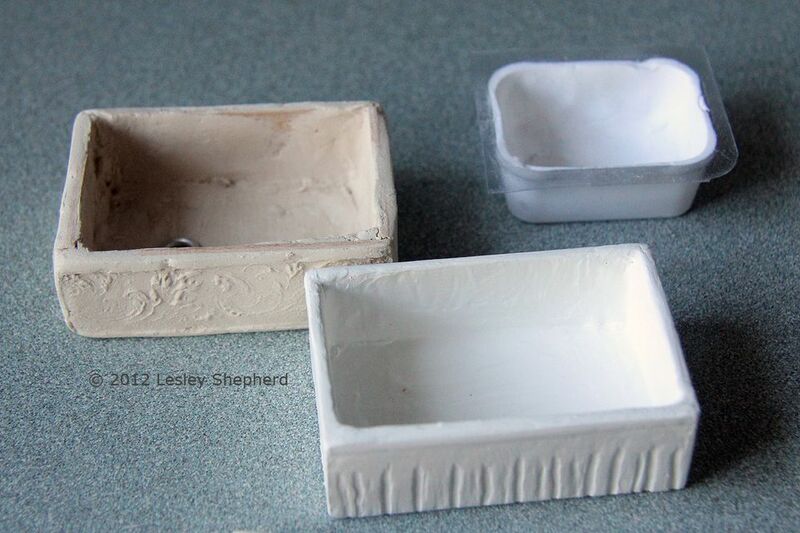 This works best if you are using paper clay over your sink base. You can do it with gesso, but it must be done when the gesso is still soft, but partially dried. To make a sink with paper clay or another air dry clay, build the wooden base as you do for the gesso covered sinks, making sure it has dried thoroughly. When the base is dry apply a layer of PVA glue to the wooden frame, inside and out. Roll out a thin layer of air dry clay/paper clay, and set the clay into the sink frame as you would pie dough into a pie plate. Carefully press the clay into the glue, and up and over the top edges of the sink, gluing the clay to the outside of the sink. Use modelling tools to smooth the clay layer, keeping it damp and pliable. When you have a smooth layer of pliable air dry clay over your base layer, press a narrow ribbon style stamp, or small peg stamps, into the front of your sink to make a suitable raised pattern. Allow the air dry clay to dry, and fill any cracks which develop. Sand the dry clay, sanding the pattern front only if necessary. Allow to dry. Paint the sink with acrylic paint, allow to dry thoroughly and finish with a coating of clear acrylic finish, acrylic floor wax, or nail polish.